Midnight Bisou did just enough to top the win machine named Escape Clause, prevailing Sunday in a photo finish at Oaklawn Park in the Grade 1, $750,000 Apple Blossom Handicap. Escape Clause inherited the lead after stalking pace-setting Wonder Gadot through an opening half mile of 47.08 seconds. Through the turn, Midnight Bisou joined the battle, taken on an outside trip by jockey Mike Smith. In the stretch, it was still Escape Clause on the inside and Midnight Bisou facing the grandstand, with the outcome decided in the final stride. 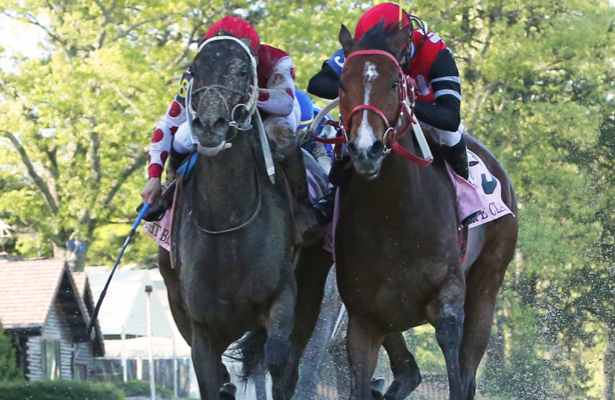 "Sometimes in races, fillies like Escape Clause will jump up and run just a tremendous race," Smith said. "My hats off to her. She made us run. "The great ones find a way to pull it off no matter what," Smith added of Midnight Bisou. "She's one of the great ones." Off at 4-5, Midnight Bisou, who has now won all three of her starts as a 4-year-old, finished 1 1/16 miles in 1:43.88. Steve Asmussen trains the daughter of Midnight Lue for Bloom Racing, Madaket Stables and Allen Racing. As for Escape Clause, who's owned and trained by Don Schnell, her underdog story continued Sunday. The Manitoba-bred 6-year-old has won 20 races in her career, including three since moved to the U.S. last fall. This marked her first step into Grade 1 competition, and she was just nosed out for another victory. Elate chased on for third. Viva Forever was fourth in the field of six. Midnight Bisou, who entered off a victory in Oaklawn's Azeri (G2), became the first horse since champion Close Hatches in 2014 to sweep both that race and the Apple Blossom in the same season. A run at an Eclipse Award of her own looks imminent. Smith, who won his seventh Apple Blossom, also swept Oaklawn's signature stakes, adding to his score in Saturday's Arkansas Derby (G1) aboard Omaha Beach. "I had a great meet here for only being here a few days," Smith said. "It's just a great meet, and who knows, maybe I'll end up back here someday."